PVC roofs are an excellent roofing option as they provide superior waterproofing and fire retardant properties. Unfortunately, these roofing membranes experience degradation and loss of plasticizers due to their chemical makeup. These single-ply membranes need to be maintained in order for long standing success. Using an elastomeric roof coating on top of the PVC to protect the membrane from early degradation is an excellent solution. PVC roofing membranes are made of two sheets of thermoplastic film with a reinforced woven scrim between the two layers. These layers are held together using a single polymer. This polymer when exposed to sunlight and solar radiation (as all roofs are exposed to) begins to deteriorate and break down causing chalking, loss of adhesion within the membrane, loss of waterproofing capabilities and an overall premature aging of the membrane. These membranes become brittle and shrink, causing flexibility issues for the PVC membrane when the roof system expands and contracts due to normal temperature fluxuation. This is especially an issue in low temperatures climates. The shrinkage adds additional stress to the seams and fasteners holding the single ply membrane together, eventually causing roof failures. The good news is elastomeric roof coatings are excellent at extending the life of an aged and failing PVC roof membrane. (Check out our case histories for proven success.) Installing a roof coating system for maintaining a PVC roof protects the PVC from the harmful sunlight and solar radiation. The elastomeric roof coatings are able to shield the PVC membrane from premature deterioration and chalking while correcting the already damaged areas. 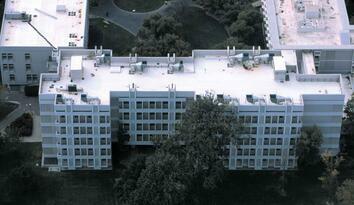 The roof coatings fill the voids and cracks created from deterioration with their superior adhesion capabilities. The newly coated and restored PVC membrane now has the ability to provide the needed flexibility it originally possessed in order to move with the building during normal and extreme temperature changes. Once the PVC roof is fully coated with the elastomeric roof coating system, the restored roof not only is watertight once again but also has renewed reflectivity, to lower energy consumption costs on cooling the interior of the building. The roofing membrane is no longer held together by seams and fasteners, instead, it is 100% seamless and monolithic, covering, sealing and protecting every inch of the roof top including areas around pipes, walls, rooftop equipment, and more. The elastomeric roof coatings are spray applied allowing every area to be filled, sealed, and watertight, even those hard to reach areas. The AcryShield Roof Management System (ARM) uses the highest quality elastomeric roof coatings available. This system has the capability of preserving and enhancing failing PVC roof membranes quickly, safely and cost effectively. You can avoid a costly roof tear-off and keep your business open as usual during installation. Contact us today for more information on our ARM System and Single-Ply Roofing options.